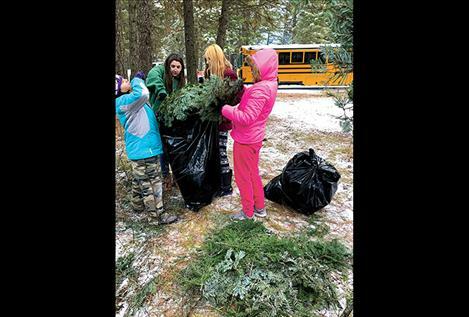 Students gather greens to create beautiful fundraising wreaths. 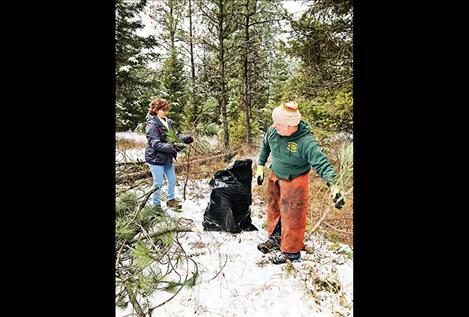 Volunteers help the Dogs with Wings students gather tree boughs. ST. IGNATIUS – Nineteen St. Ignatius Middle School students put on their wings for the holiday season to help children in need. The group is called Dogs with Wings because the school’s mascot is a bulldog and the students are doing the work of angels. The group is part of a school project that has been in existence for about a dozen years. 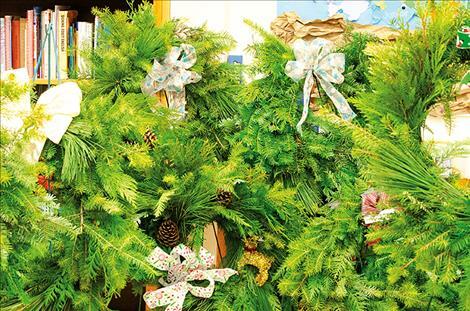 In Valerie Umphrey’s class, the group members made wreaths to sell to raise money to buy gifts for children that don’t have much for Christmas. Teacher Dorothy von Holtum showed the students how to make wreaths. Connie Plaissay, retired florist, also worked with the group. Several former members of the Dogs with Wings program, other students and families also helped make the wreaths. Umphrey said people enjoy helping with the service project. The large wreaths are almost a yard across in length. 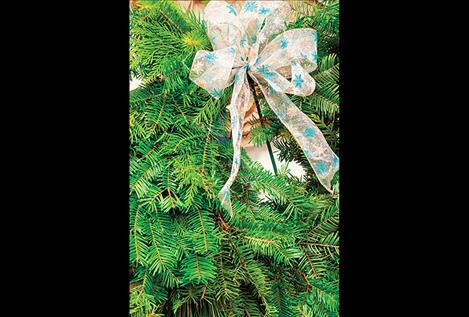 The students arranged greenery from tree boughs on a metal loop until a wreath was formed. Decorative bows and ribbons were also added. Before wreaths were made, the Dogs needed permission to cut boughs in tribal wilderness. Group members went and asked the Confederated Salish and Kootenai Tribal Council for permission. The Council approved of the project and sent CSKT Forestry members to help, including George Orr, Ron Orr and Monty Marengo. 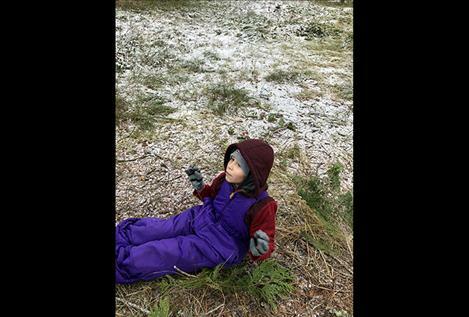 They cut Douglas fir and cedar tree boughs and delivered them to the students. The Dogs trimmed the boughs into usable pieces during a fieldtrip to the wilderness area. The Dogs also made Yule logs, swags and dried dogbane bracelets. The students learned to make the dogbane cord from Frank Finley at the Salish Kootenai College. Steve Allard and Miss Aimee’s mother, Mrs. Kudrna, donated the beads for the bracelets. The Dogs usually provide gifts for 12 children using tags from the Share the Spirit program, but this year, the program isn’t in operation. Umphrey said the Dogs decided to shop for and donate items to help children through the Toys for Tots program. “These kids are doing an amazing thing,” Umphrey said of the Dogs with Wings. “They are overlooking their own needs to help others. The 2018 Dogs with Wings include: Sonya Brooks, Curtis Brown, Hope Druffel, Valon Easterbrook, Cameron Oliver, Abbie Orr, Taevius Roberts, Junior Stenberg, Redrock Bell, Baptiste Bourdon, Lanie Lammers, Emily Marie Lucero, Xavian Lee, Jasmine McNutt, Jasmine Simmons, Chance Bockman, Lu Swaney, Nic Frost, and Gabriel Smith.